Health at Home Nurse Lisa Lucero, R.N., offers Delfina Duran encouragement during recovery. When Delfina Duran, 41, of Fairfield, reached the NorthBay Medical Center Emergency Department (ED) on Friday, May 17, it had been 10 hours since she had suffered a stroke. Delfina says she had no feeling in her arm or hand, but decided to go to bed, hoping to be better in the morning. Instead, when she awoke she couldn’t speak and her right side was weak. Alarmed, her husband Apolinar and the entire family rushed her to the hospital. The triage nurse immediately admitted her to the ED. “When we first saw Delfina, she was very anxious about what was happening to her,” remembers Rosalie Toloumu, R.N., who cared for her in the ED. Delfina’s initial examination included a neurological assessment. It revealed she couldn’t hold her right arm up and her grip strength was weak. And she still couldn’t speak. ED physician Caesar Djavaherian, M.D., called a Stroke Alert, which immediately marshaled an array of hospital resources to help Delfina. This cleared the way for a CT scan of her brain, as well as lab work and an IV. Delfina Duran poses with her daughters, Cindy, 11, center, and Janet, 5. The first step in treatment for Delfina was determining just what type of stroke she had experienced.There are two types of stroke, ischemic and hemorrhagic. Ischemic stroke occurs as a result of an obstruction within a blood vessel supplying blood to the brain. It accounts for 87 percent of all stroke cases. Hemorrhagic stroke results when a weakened blood vessel ruptures and bleeds into the surrounding brain. Although less common, it often requires immediate intervention. Delfina was sent for a CT scan, which is a quick and easy way to detect bleeding inside the brain. Fortunately, NorthBay Medical Center is home to a powerful, $2 million Phillips 256-slice scanner which produces extremely high-resolution images with reduced radiation exposure. The scan revealed that Delfina did not have bleeding in her brain, ruling out a hemorrhagic stroke. “After the CT, the doctor came to us and said ‘I think we know what’s wrong—your mother has had a stroke,’” Cindy remembers. Because Delfina had not reached the Emergency Department within three hours of the start of her stroke symptoms, she was not eligible to receive the clot-busting drug tPA. Instead, she was admitted to the hospital’s intensive care unit. In the first few hours and days following a stroke, the patient is at risk of having a second stroke. They also are susceptible to serious complications that can include seizures, brain swelling and infections such as pneumonia. Once she was in the ICU, Intensivist Sreenivasa Ravuri, M.D., ordered a Magnetic Resonance Imaging or MRI. It is one of the most helpful tests in the examination of a stroke. By this time Delfina said she was feeling ill and had a big headache. With her stroke identified, she began an intensive course of medical management. By Sunday, Delfina could speak. She spent a total of six days in the hospital, including four in the ICU. She gradually regained her strength and began moving her arm. A physical therapist taught her how to exercise her arm and a speech therapist coached her on speaking. 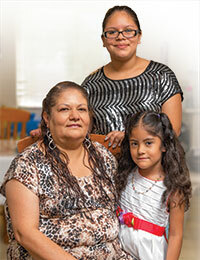 By the time she was discharged, Delfina was still weak, but well on the road to recovery. NorthBay Health at Home nurse Lisa Lucero, R.N., monitored her blood pressure and kept an eye on her progress once she was home. “Today, she feels much better, although sometimes she knows what she wants to say but can’t find the words,” Cindy says. “We are so very thankful for the people who helped her.” “Delfina had the best possible outcome,” Gallegos adds. NorthBay Healthcare’s Women’s Resource Center is proud to host the New Beginnings Support Group for caregivers and survivors of stroke. Monthly meetings are every third Tuesday from 10 to 11:30 a.m. at the Gateway Medical Building, 1860 Pennsylvania Ave., in Fairfield. According to Angela Kirk, coordi-nator, the group provides a great opportunity for survivors and caregivers alike to get the support they need from people who understand what they’ve been through. The group has been meeting the past 12 years, most recently at a Fairfield church, but decided to move to the Women’s Resource Center in August to be in a more central location and to draw more participants and support staff. NorthBay will support the program by providing a number of expert speakers, according to Jane Prather, NorthBay Healthcare’s service line director for the development of neuroscience, women’s healthcare and orthopedics. For information about the group, call Kirk at (707) 432-5710.